I don't know about you, but I'm a huge fan of washi tape. If you don't know what that is, it's basically decorative masking tape that originated from Japan. The name is derived from a portmanteau of the Japanese words "wa" (which means Japanese) and "shi" (which means paper), so it literally means "Japanese paper tape". It comes in so many different patterns, which can easily leads to hoarding collecting. However, washi tape can be one of those things where you like the idea of it, but you don't know how to actually use it. 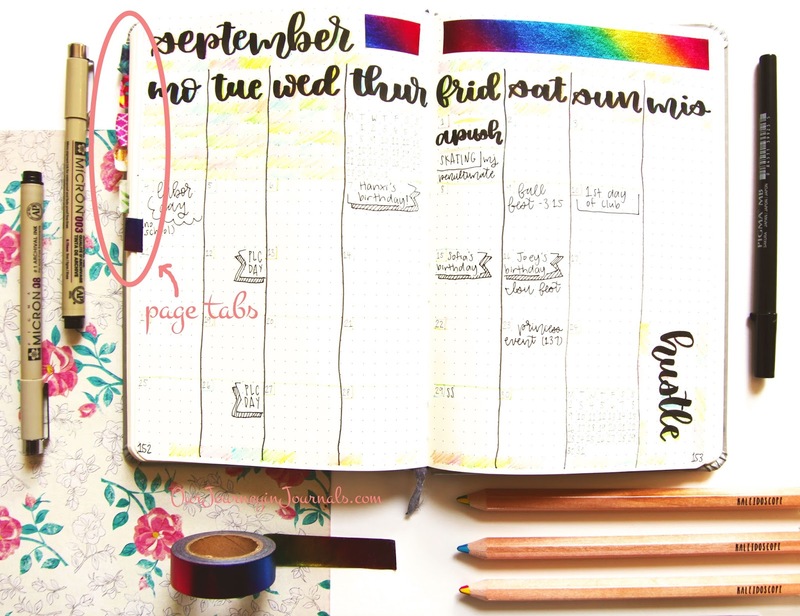 Fortunately, your bullet journal is a great opportunity to use lots of it, so, here are some ideas on ways to use washi tape in your bujo! Probably my most commonly used way to utilize washi tape in my own bullet journal is by sticking it wherever I have empty space (purely for aesthetic reasons). This doesn't serve any real purpose other than making your spreads look pretty. I do this mainly in my daily spreads, but I also do it in random collections and on certain places in my monthly logs (if you look at my monthly setups, you can see that I use washi tape in the same place on each monthly spread). A more practical use for washi tape is for marking special pages. I personally use this technique by making a page tab out of washi tape and using that as a bookmark for my monthly logs. Some people do the same thing with other useful spreads by taping along the entire edge of the page, and I've also seen some people do that with every page that they use in each month, using a different pattern of washi each month. You can also make repositionable page tabs out of washi tape by taking a strip of washi and partially folding it down so that there's still some adhesive exposed. If you're afraid of ripping your bullet journal's paper when moving the page tab, you can stick it down onto your clothes a couple of times to reduce the stickiness. If you have a specific color code for different spreads (i.e. if you like marking all of your daily spreads with one color, all of your work-related spreads with another, all of your family-related spreads with a different one, etc. ), you can use washi tape - instead of using color with a marker or pen - by taping along the side, either in just one specific place on the page or along the entire length of the page. This is the first page of my second bullet journal, and I messed up on the VERY first page. To cover it up, I washi taped some scrapbook paper on top of the mistake. If you don't like seeing mistakes in your bullet journal, you can use washi tape to cover them up. 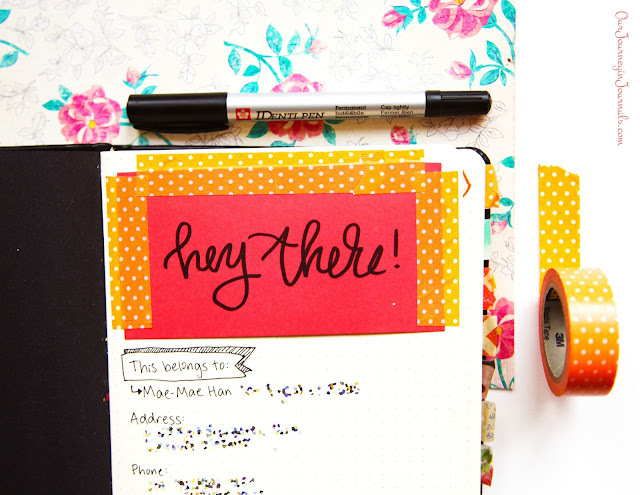 Besides just putting washi directly on top of the mess up, you can also use washi tape as a cute way to adhere scrapbook paper down, which is an easier way to cover up a larger area. Washi tape can be utilized as a clear way to divide up parts of a page, such as if the top half of the page is a daily log and the bottom half is something else like a grocery list. You can also use washi tape as part of headers/titles/words that you want to stand out, whether it be for daily logs, collections, or any other of your bujo spreads. However, just keep in mind that you would most likely need to use a permanent marker to be able to write on most rolls of washi tape. An alternative to writing directly on the tape itself to make headers is by using thin washi (or cutting up a piece of tape into small strips) and using it to box around words or using washi to underline writing. 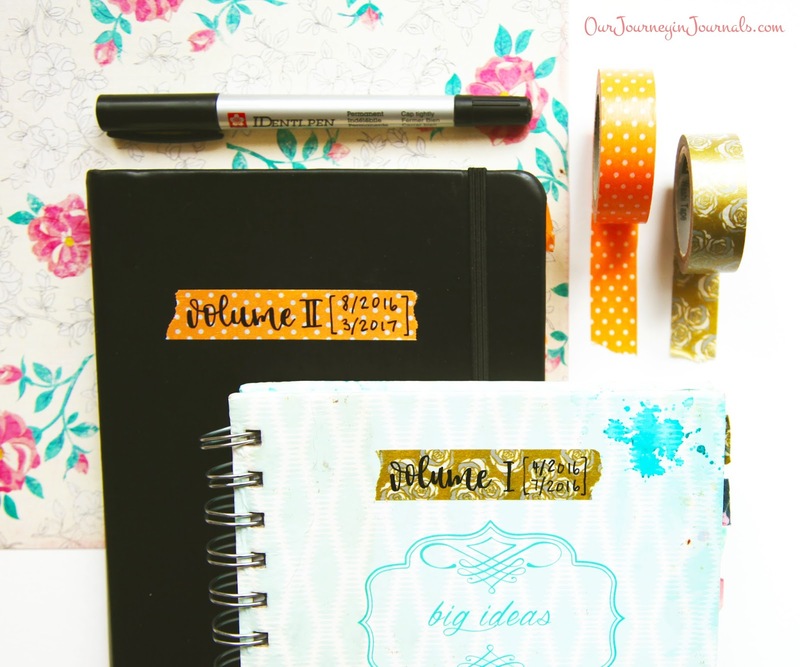 Another way to use washi tape in your bullet journal is for scrapbooking - specifically for taping in memorabilia such as pictures, tickets, notes (especially cheap sticky notes that don't have a strong adhesive), or other small things. I suggest checking out Emily of @SnowyStudies on Instagram for some inspiration. I know that Leuchtturm notebooks come with label stickers that you can put on the cover or spine. 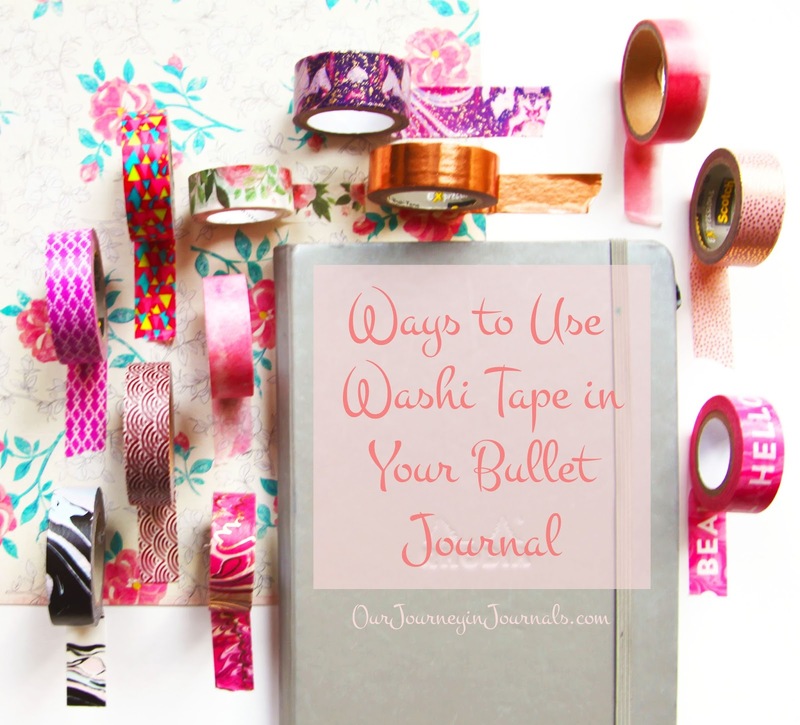 However, if you want something pretty and patterned or if you don't use Leuchtturm notebooks as your bullet journal, you can use washi tape as labels to date your various bullet journals. I personally just put a piece of washi onto the cover and write "Vol. #: [date-date]" using a permanent marker. Lastly, you can utilize washi tape in constructing a Dutch door spread. A Dutch door spread involves cutting up your pages (so I'm personally not a fan haha) in order to be able to easily refer back to one main/central spread, which can be useful for spreads like weeklies. I suggest checking out this YouTube video for more information on Dutch door spreads for bullet journaling. I hope this gave you some inspiration on ways that you can use washi tape in your bujo! I own far too many rolls of washi, so I've lately been consciously trying to make an effort to use the stuff more often. If you're like me (or if you need some reason to justify buying more washi), these ideas can definitely help you out! If you know of any more methods, be sure to help us out and leave them in the comments! I've used washi tape on the edges of pages I wanted to mark, but unlike tabs, this way, they don't jut out, so they're very subtle markers. Valuable information in your blog and I really appreciate your work and keep it up dude I really very informative blog about the Vivid Watercolors well done.